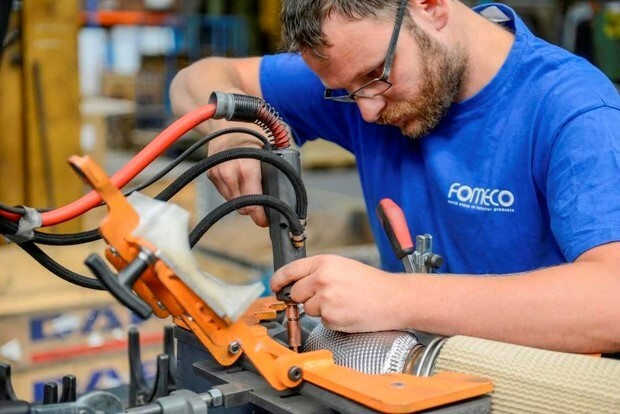 At Formeco, a Belgian company from Zwevegem, pipes and plates are produced on a just-in-time basis. A company where customers had the opportunity to amend orders very late on and long lead times made planning and quality control ever so difficult. Then the company decided to gradually introduce QRM, halving the lead time of one production line in the process! Fomeco has long sought to produce more efficiently without compromising flexibility. To that end, the company adopted more efficient planning tools and took Sirris’ QRM training. The next step was to review its production process. The company, an expert in plates and pipes, decided to implement a step-by-step process for shortening lead times. A team of committed staff members started off with small experimental steps in line with the continuous improvement method. For instance the production order release time was changed in the schedule. Fomeco then gradually reduced the production run size starting with the sawing process. At the same time, the project team sought extra capacity at workstations via more efficient working methods. All this led to shorter lead times, meaning that Fomeco could start working on an order much later. The first phase was a success: the internal lead time of one of the production lines dropped from 50 to 25 days. The company has received many positive responses from customers and will continue along the same path.